To Enhance People’s Lives through Outstanding Outdoor Adventures. We believe that river trips are not simply vacations; they are life enhancing experiences. We believe that seeing the majestic beauty of the red rocks, hiking through pristine southwest desert environments, or simply floating through silent and awe-inspiring canyons away from modern technology are experiences that everyone should have. We place client and staff safety as our #1 priority on every trip – no exceptions. Our staff is extensively trained to proactively recognize and prevent safety issues and our excellent safety record reflects that. When you sign up for a trip with us you can trust that everything you need will be included. We will never charge you extra for camping equipment, wetsuits, or other necessary gear – all you need to bring is your clothing, personal items, and sense of adventure! It doesn’t matter if you’ve never been on a river before or are a raft guide yourself – you can be assured you’ll have an excellent time on a trip with us! Our guides are skilled and highly trained professionals with the experience and expertise to safely navigate any stretch of river. We make your trip both comfortable and exciting and our goal is to make your trip to be the best vacation you have ever taken. 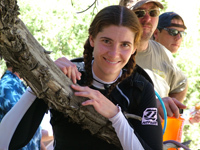 Sheri Griffith River Expeditions’ guides are the best in the industry. All have been carefully selected for their commitment to excellence and their personal dedication to safety, customer service, and the environment. They are thoroughly trained in the art of river rafting, river rescue, and the exacting “Sheri Griffith Style” standards of customer service. We mostly focus on small, personalized trips with a guest to guide ratio of less than 5:1 because we believe that small groups lead to a better guest experience. We also work with vendors and suppliers to negotiate the best rates and pass those savings along to you. Rest assured that any trip you take with us will be the best value for the money that you’ll find anywhere. If you want to do it right the first time, go with the company chosen most frequently by professionals/the experts! When a famous movie star wanted to escape Hollywood with his friends we were chosen because we run higher quality Colorado River rafting trips than any other company. When The River of Dreams and The City of Phoenix wanted a life enhancing adventure for people of varied abilities we were chosen for our diversity, inclusiveness, and ability to customize trips to meet client needs. When Good Morning America profiled “The Ultimate Family Vacation” we were selected for our array of creative and fun family programs and our reputation for safety and value. When the Honorable U.S. Senator wants to take his family, friends or associates on private getaways, we are the company he keeps coming back to because of our consistent quality, professionalism, and discretion. When The Nature Conservancy provides a wilderness experience to its members, we are chosen for our knowledge of the natural environment and sustainable tour practices. When The Nature Conservancy sponsors a river trip exclusively for its members, we are chosen for our extensive knowledge of the natural environment and our environmentally-friendly tour practices. When year after year 70% of our guests return with friends and family and recommend us to others, we know we are meeting our goal of creating fun, memorable, and outstanding outdoor vacations. The history of Sheri Griffith River Expeditions (SGRE) began in 1971 when siblings Sheri, Ron & Mark Griffith started a river company called Colorado Adventures. They began running exciting one-day whitewater rafting trips on the Upper Colorado River, Elk River, North Platte River, and Arkansas Rivers in Colorado. In 1981 Sheri Griffith moved the family to Moab, Utah and changed the company name to Sheri Griffith Expeditions. The focus of the company shifted from one-day whitewater rafting trips to multi-day experiences that emphasize relaxation away from the pressures of the modern world. 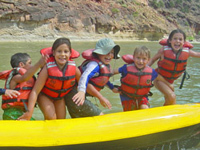 The first Sheri Griffith Expeditions river trips focused on Cataract Canyon, Westwater Canyon, and the spectacular Fisher Towers section of the Colorado River. They also started running trips on the Dolores River and the Desolation Canyon section of the Green River. Sheri Griffith Expeditions quickly developed a reputation for running high-quality and exceptional value river trips and expanded their existing offerings through the early 1990s. In 1998 the company obtained the permits necessary to visit Dinosaur National Monument by running the Green River through the Gates of Lodore Canyon. That year they also obtained a permit for trips on the Yampa River. These two trips have remained SGRE’s most popular trips to this day. In 2002, the seasoned Sheri Griffith Expeditions Operations Manager, Jose Tejada, and his son, Arlo Tejada, purchased the company from Sheri. They have maintained Sheri’s commitment to river trips of the highest quality at an exceptional value while developing new and innovative trip options, such as “Family Only” rafting trips and “Expeditions in Luxury” trips. Family only trips are designed to accommodate children as young as five and emphasize fun and adventure at a level appropriate for all ages; while Expeditions in Luxury trips have been designed for discriminating travelers accustomed to excellent customer service and a high level of comfort. Expeditions in Luxury river trips include five course meals prepared by professional chefs, a larger camp staff, and luxurious camping accommodations in breathtakingly beautiful wilderness environments. 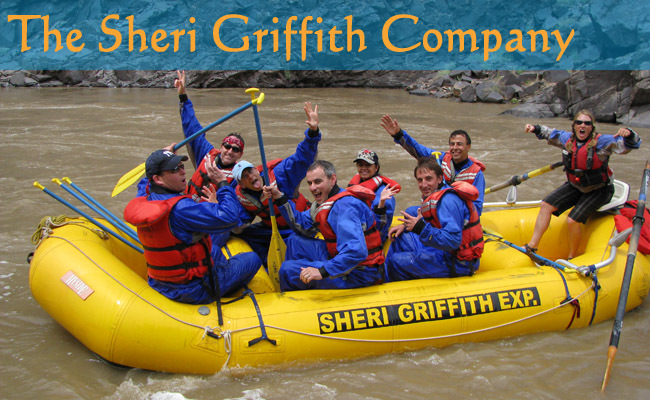 Today Sheri Griffith River Expeditions is one of the most well-recognized and respected companies in the west. We have the most experienced, respected, and highly trained river staff in Utah/Colorado and in the United States and an office staff committed to providing the highest quality customer service you’ll find anywhere. Trust the 100,000 guests We have taken on high-quality river adventures since 1971 and join us for your next outdoor adventure! Sheri Griffith River Expeditions is an authorized concessionaire in Canyonlands National Park and Dinosaur National Monument. We are also an equal opportunity employer.